Obituary – Cress, Curg Kay « Perry High School Alumni Association, Inc.
﻿- will enter the college of commerce at Oklahoma A. and M. College at Stillwater next year. Kay is the son of Mr. and Mrs. C. F. Cress of 905 Fir, street. He was born at Cedar Point, Kans., and has attended school in Stillwater and here. He was on the football squad, in the basketball lineup, played tennis, went out for wrestling, was in the cast of the operetta and in the senior play. He won a letter in basketball. During his high school days he has worked for Forney’s Dairy, Safeway and at a bowling alley. 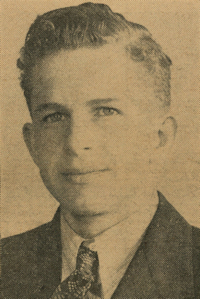 Second Lt. Curg Kay Cress was killed in action on November 11, 1944, when the B-24 Liberator bomber on which he was serving as navigator went down in the Adriatic seas northeast of Ancona, Italy, with the crew aboard. Cress, son of Mr. and Mrs. C. F. Cress, 1202 Ivanhoe, was born at Cedar Point, Kan. on August 13, 1922, and came to Perry with his parents when three years old. He attended both grade and high school in Perry and was active in sports, playing both basketball and football. He attended Oklahoma A. & M. college at Stillwater for one year and the Northwestern State college, Alva for three years. Cress participated in tennis competition while in college and was an active member of the Alva fire department. Lieutenant Cress enlisted in the air corps reserve in September, 1942 and was called to active duty in May, 1943. He received his commission and navigators wings at San Marco, Texas, on July 1, 1944. He had been overseas only two weeks, with the 15th airforce stationed in southern Italy, when his plane failed to return to its base. He was reported missing in action on December 7. He was married on August 7, 1942 to Miss Helen Steffee, Jefferson. Survivors besides the widow, who is employed in an aircraft plant at Wichita, Kan., and his parents are one brother. Pfc. Max Cress with the fifth air force in the Phillippines, two sisters, Miss Velma Cress LaGrands, Ore., and Mrs. Alberta Ley, Berkeley, Calif., and a brother-in-law, Lt. Frank Ley, now somewhere in the south Pacific. Curg Kay Cress, Second Lieutenant, U.S. Army Air Corps. Home address: Perry, Noble County. Mrs. Helen Cress, Wife, Jefferson, Oklahoma. Born August 13, 1922. Enlisted September 1, 1942. Decoration: Order of the Purple Heart awarded posthumously. Attended Perry High School, Oklahoma A. & M. College, Stillwater, and Northwestern State College, Alva. Active in sports. 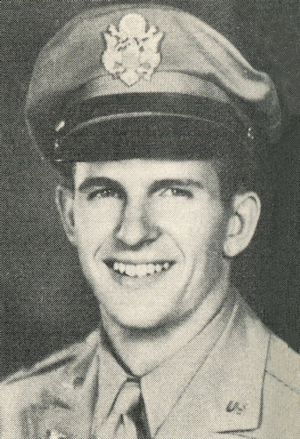 Received his commission and wings at San Marcos, Texas, July 1, 1944. Served overseas two weeks as Navigator on B-24 (liberator) in the 15th Air Force stationed in Southern Italy. Died November 11, 1944, in action over the Adriatic Sea.